The challenge of the green bibbed racers was to kayak, bike and run – with bravery and cunning – to find 28 checkpoints around the harbour and hill perimeter of Nelson within six hours. It was the ENVCO sponsored Lost Ensembles Adventure Racing Team that took up the challenge set down by the Rollo Adventure Race – Urban Nelson. This is their story. 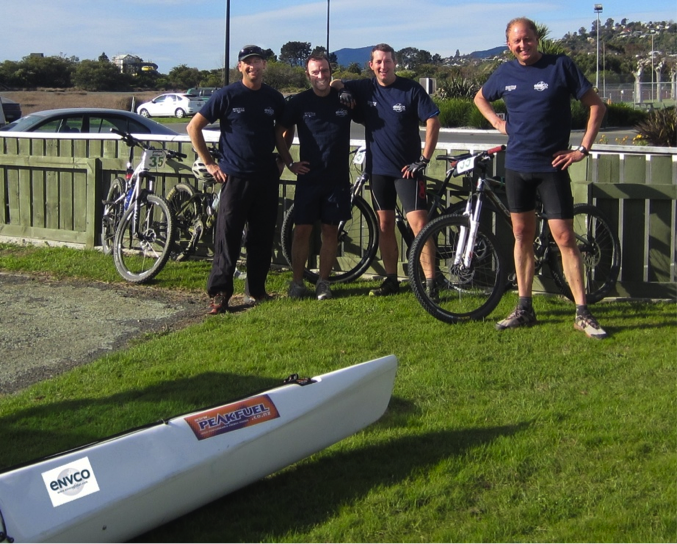 Caption: ENVCO Ensembles Adventure Racing Team members Kieran Scott, Andy Weaver, Chris Strang and Martin Doyle. Last year the team had a narrow victory over the teenage daughter and her team and, with the fitness and skill curve ascending in one case and declining in the other, it was time to let tactics triumph over physical ability. The day dawned calm and clear. The maps were handed out and we had 45 minutes to select the best choice of route. We opted to do an orienteering segment first and made good progress around that section before setting out on the kayaking leg. We had timed our kayaking to take advantage of the strong current sweeping into the estuary, and with 4 control points tucked away the tide had turned and carried us back to the transition area. Take that, teenager! Next we mounted the bikes. A series of control points were picked up around the lower areas of Nelson before we had no choice but to cross some contours and climb the largest hill in the City backdrop. This section was steep and hot and pretty difficult for everyone. Some of the navigating was tricky, but we negotiated our way around our selected course ok, and then we only had to make our way back to the finish. We calculated we needed 40 minutes to get back, and we had to push hard to make it – handing in our card with 30 seconds to spare. We managed a pleasing but hard won 2nd in our category. As for the teenage daughter? She had to pull out of the race early on – and here we thought we were the smart ones! Once again we thank Envco for sponsoring the team. Cheers Richie!